I’ve been a Dwyane Wade apologist ever since he entered the league in 2003. Part of me still wants to write the definitive book or essay about his career. On why he was great, frustrating, a leader, and perhaps a relic from the era that came right before his time. However, no matter how much I will love or root for him, Lebron James is and will always be a better player than Dwyane Wade. Last night’s game almost made me cry. First, I almost cried with anger multiple times when the Heat stopped moving the ball and moving on offense in the third quarter when they could have pulled away from Boston earlier than they eventually did. They started playing hero ball and isolating instead of getting Wade and Lebron on the move and getting them shots from under 15 feet. Then, I almost cried because I just could not understand what Wade was doing at certain points: not getting back on defense, not stopping Rondo early enough in the open court, forcing action on offense, and just missing easy shots. But ultimately, I almost cried because Lebron James played perfectly, the Heat won and I am not sure how many people will actually appreciate it. @ZachLowe_SI: Reader asks via Twitter: ‘OK, so why can’t he do this every game?’ He has 45 points on 19-of-26 shooting. I give up. Plus you throw in the fifteen rebounds and the five assists and you can turn that “I give up” into an “I give up…FOREVER” just for emphasis. The lesson, as always, might just be that people are stupid. That’s certainly an answer and something that is easy to turn to, but no matter how “stupid” people or the public might be, there is something deeper, something more related to our innate behaviors and our desire to want more. In his piece on Kevin Durant yesterday, Jay Kang said that people, or at least the sports consuming people in the world, don’t like anything that seems preordained. However, in the case of Lebron James, it seems to me that people are upset because what he is doing doesn’t seem preordained enough, if that makes sense. Lebron came into the league and was anointed “the King” before he even did anything. So we expected him to be great and, despite whom we rooted for, wanted him to be great. Sure I have had a love affair with Dwyane Wade and forgive him of nearly all of his trespasses and pretend I am him each time I play pickup basketball (I make forced drives, random layups and spectacular, gambling steals all the time against high schoolers), but I still wanted and want Lebron James to be great and to be as great as he can be. I want to watch classic games like last night’s contest where he and Rondo, two athletic freaks, are running down the court challenging each other, and in some slight competitive lull, giving each other small Mona Lisa smiles because they both knew that there was no one else on the court that could understand the game or their body’s ability to play game as well as they could. And because we want Lebron to be so great, because we want more than 50 percent, we want 100 percent of everything; no matter what Lebron does will never be enough. When Lebron puts on a display of overall dominance like he did last night, we ask why he can’t “just do that every night”. After Lebron’s 45-15-5 we have people calling up sports shows and saying that one night of sublime greatness doesn’t replace a championship. Again, this might just come down to the fact that most people and sports fans are short-sighted or small minded—“idiots” for lack of a better word. However, I still do believe that it comes down to the fact that we perhaps believe that Lebron was preordained for more success than he has actually achieved. We want and love to dream about the possibilities in sports, however in an age of spoilers and entertainment “On Demand”, we want our legacies created, boxed and given to us immediately. Lebron’s greatness should be “Manifest Destiny in a minute”, something that was meant to happen and something we can read over during lunch break. 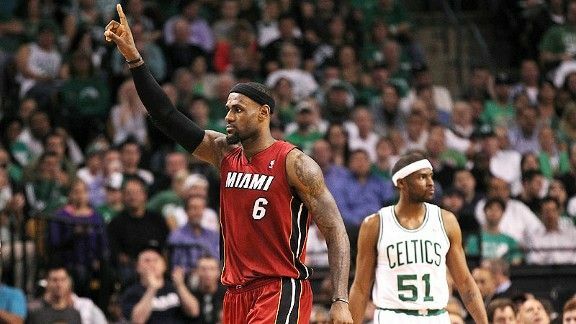 Sure, Lebron raised the level of pressure and expectation for himself with the Miami pep rally and the “Not five. Not six. Not seven. Not eight” speech, but isn’t that what we wanted him to say? Isn’t that the drive we want our preordained (hmm…very Shakespearean) King to believe? In the end, it all comes back to Michael Jordan. From our vantage point in 2012, the story of Michael Jordan’s rise to glory, including all the failures, the triumphs, the psychotic competitive behavior has become an imbedded part of American mythology—it is as much in our canon as Plutarch’s Lives were in the canon for Shakespeare when he wrote his plays. So no matter what, Lebron must live up to the greatness, the competitive fire and emotional sincerity regarding basketball that Michael Jordan had. No matter what anybody says, Michael Jordan’s narrative, personality and myth are still lingering freshly in our minds as a sports culture precisely because they are firmly embedded in the bedrock of our consciousness. Last week I was watching a video of Michael Jordan destroying the Indiana Pacers in February of 1993. The most amazing thing to watch was Jordan’s body control on the court—he seemed to exist outside of physical limitations, awkwardness and, of course, gravity. When you watch any video of Jordan, you just did not expect him to make a mistake. This is the memory of him I constantly carry with me when watching any great player play today. However, this memory is absolutely not true. Just last night during commercial breaks of the Heat/Celtics game, I watched a classic Knicks/Bulls game from their legendary 1992 Playoffs series. In Game 1, the Bulls were stunned by the Knicks and I watched as Michael Jordan airballed a three pointer in the closing minutes (Pippen did put it back, but still) and the Bulls lost. At the time, the Bulls were dissected and Jordan questioned, but because the media was less immediate and because the complete Jordan narrative had not yet unfolded, there was not the same degree of scrutiny as Lebron faces today. Like Kang said, we cut Jordan more slack because he did not seem preordained; he was an otherworldly folk hero who vanquished all his enemies on an easily understandable trajectory to success. From Lebron, we might dislike him because he feels preordained, but even so, we want more from him because of that very fact. It is a strange paradox, but that paradox seems very fitting for the player that is Lebron James. And her last comment is really what it’s all about. No narrative. No constant search for meaning. No legacy or preordainedness. Just the simple facts from an outsider watching basketball. Do not take what happened last night for granted. Everything ends.